Carpe Diem Art and Learning Centre, Majorda recently screened a film offering a glimpse of a chapter missing from our history of urban India. 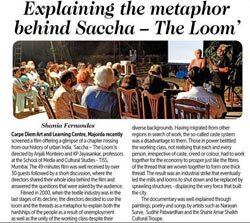 'Saccha - The Loom'is directed by Anjali Monteiro and KP Jayasankar, professors at the School of Media and Cultural Studies - TISS Mumbai. The 49 minutes film was well received by over 30 guests followed by a short discussion, where the directors shared their whole idea behind the film and answered the questions that were asked by the audience. Filmed in 2000, when the textile industry was in the last stages of its decline, the directors decided to use the loom and the threads as a metaphor to explain both the hardships of the people as a result of unemployment as well as the unity of the working class despite their diverse backgrounds. Having migrated from other regions in search of work, the so-called caste system was a disadvantage to them. Those in power belittled the working class, not realising that each and every person, irrespective of caste, creed or colour had to work together for the economy to prosper just like the fibres of the thread that are woven together to form one thick thread. The result was an industrial strike that eventually led the mills and looms to shut down and be replaced by sprawling structures displacing the very force that built the City.